The number of user-friendly, appealing BitTorrent clients available for the platform are very few in comparison to the number of those available for Windows. In this article we will highlight the most popular Mac BitTorrent applications and compare their features. Mac OS X is heralded as the most appealing operating system on the market and one of the most capable as well thanks to its BSD (Unix) core. Sadly, the number of user-friendly, appealing BitTorrent clients available for the platform are very few in comparison to the number of those available for Windows. In this article we will highlight the most popular Mac BitTorrent applications and compare their features. Let’s start with the granddaddy of them all, Bram Cohen’s self-titled BitTorrent application. It’s gotten kind of confusing since he named the protocol, his company and his application all BitTorrent. BitTorrent OSX is a very (and I mean very) basic application. It’s as feature-full as Safari’s download box and that’s not saying much. Now some people wouldn’t mind something like that, but if you’re looking for simplicity Transmission is a much better choice. BitTorrent OSX also takes an age to start up on my MacBook Pro. Transmission is my current Mac B.T. client of choice. It’s an Open Source project, maintained by the developer of the popular Mac DVD ripping application, HandBrake. Transmission does its job well. A neat feature it offers is the ability to view download and upload rates in the dock, so I don’t even have to open up the program to check how my downloads are going. Another great thing Transmission does is copy the .torrent file to its support folder, then trash the original file from my desktop thereby leaving no mess of files behind for me to clean up. Now just like everything Transmission has its flaws, the biggest of which is that Demonoid, a leading BitTorrent directory has banned it on ocassion! They say it doesn’t adhere to set standards. Azureus is a cross-platfrom BitTorrent client written in Java. It’s slightly slower than all the other native Mac B.T. applications, but has features none of the others can boast of. Therefore it remains one of the most popular clients, even on the Mac. The one reason I have both Azureus and Transmission installed at any given time is because Transmission doesn’t allow me to select which files I want from a particular torrent. We call the feature ‘Selective Downloading’ and Azureus is sadly the only popular Mac B.T. client that lets me do that! There are also a number of great plug-ins for Azureus that let you do all sorts of things like subscribe to RSS feeds with .torrent enclosures. Tomato Torrent is a very plain alternative, seriously lacking in eye-candy and begging for a new icon (and maybe a new name too). It’s based on the official BitTorrent client. I think it desrves a mention because I know a few people who swear by it. It comes with an AppleScript file that you can place in folders you want to download to. When you want to download a torrent to a specific folder, you just drag the .torrent file onto the piece of AppleScript to initiate the transfer. One pro is that it’s an extremely light client that hogs very little RAM. It’s the closet thing to uTorrent on the Mac. Bits on Wheels is a slightly out-dated (last updated Sep. ’05), yet popular Mac BitTorrent client. It claims to be “the first 100% native BitTorrent client for the Macintosh” as it is written in Objective-C and Cocoa. 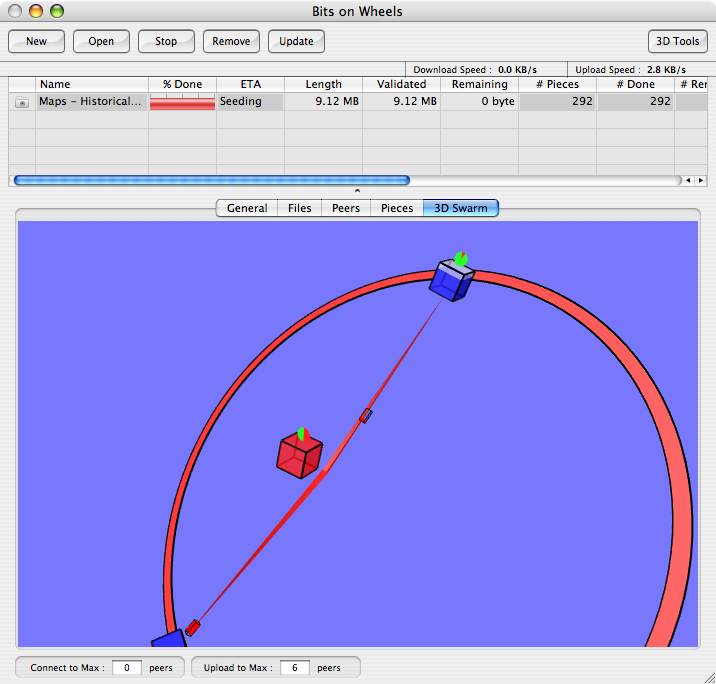 Bits on Wheels is freeware but not Open Source. One of its main features is a visual 3D Swarm with which you can observe what’s actually going on under the hood, how many seeders and leechers you’re connected to and the bits transferring between everyone. Bits on Wheels is very OSeXy (heh! ), it’s how I’d imagine the default OS X BitTorrent downloader to look if there was one. If not to use the first native OS X B.T. client, I’d download it just to fly around in 3D chasing bits. Clearly, feature-wise Azureus is the winner. Bits on Wheels and Transmission are both great alternatives to BitTorrent OSX. If only Bits on Wheels would be updated more often and Transmission become standards-compliant and both of them allow Selective Downloading, they might start taking back some market share. And lets not forget the light weighted tomato. Tomato Torrent could use a few more features and better interface, but it too is a great BitTorrent client. Acquisition is a Mac p2p program like Limewire that accesses popular file-sharing networks like Gnutella to search for files. It also doubles as a BitTorrent client. Although I have never been able to achieve superior download speeds that I do with Transmission or Azureus, it’s iTunes-integration is sweet.